Pomeranian Coarsewool Sheep, also known as just Pomereranian, or Pommersches Rauhwollschaf; Pommernschaf; or Rauhwolliges Pommersches Landschaf) is an old domestic sheep breed from the Pomerania region (split between Germany and Poland). The first records of similar sheep in Pomerania can be traced to more than 3000 years ago. They are raised primarily for meat and vegetation management. 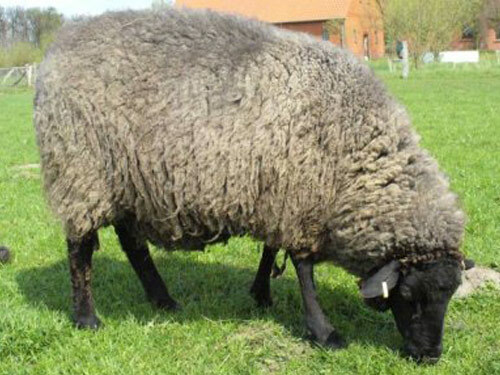 Pomeranian Coarsewool Sheep are polled (hornless), and have a black head with slate-blue or grey wool on the body; the lambs are born completely black. Their legs are covered with wool, and have a blue tongue. Their fleece has shorter hairs amongst the longer wool. Initially, Pomeranian Sheep were called Grauwollschafe ("greywool sheep"), which in time changed to Rauhwollschafe ("coarsewool sheep"). They almost vanished in the second half of the 20th century, when the population dropped below 100 and it was placed on the Red List of endangered livestock breeds. Their population has since recovered somewhat. Pomeranian Coarsewool Sheep are very hardy and are able to live outside all year, they even raise lambs in the snow. They thrive on poor forage.